Portals to the Past’s award winning WW2 team, Corporal Alf Vincent of the Home Guard and Mrs Coombe -Watson provide a vivid experience of life in Britain during WW2. Eversholt Lower, Beds We all had a fantastic day. This is a great way for children to learn. They all enjoyed it very much and retain the information given. Bunty and Corporal Vincent’s enthusiasm of their subject was captivating. Thank you both very much. The interactive delivery is a balance of education based activities, facts, useful knowledge and a chance for children to see and try real period clothing. Alf and Bunty to put across the community spirit, the national cohesion of the time and what total war meant to everyone, especially children. Northmead Junior School, Surrey Thank you for such an interesting workshop. The feedback from the children was very positive. As teachers we feel they learnt a lot from it. Thank you for the “hands on” nature of the activities – this is what our children like to do and how they learn best. The day’s activities begin with a lively introduction to the period. The afternoon includes having fun in the war, a good old-fashioned sing-along and dancing. Breckland Park School, Norfolk Thank you so much for an informative, enjoyable, very well organised, jam – packed with information day. The pupils and staff thoroughly enjoyed it and everybody learnt so much. Full details of this workshop can be requested from our website. Richard and Beverley Bowring are members of First Allied Airborne Association (American Army Nurses), Battle for Europe (British Army) and the Real Dad’s Army (Home Guard). 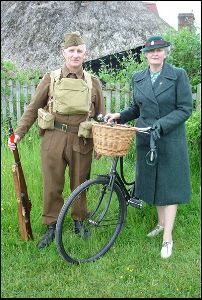 In 2010 they won the ‘Best Contribution to Schools’ by World War II Re-enacting magazine.